Climate change perception, landscape perception and management practices in coastal areas are integrally related. Climate change becomes grounded and is given meaning through landscape practices. Coastal management and climate change adaptation in theory and practice, have nevertheless struggled to deal with cultural aspects relating to the mediation of perception through landscape and the influence of climate vulnerabilities on the social construction of space, place and landscape. 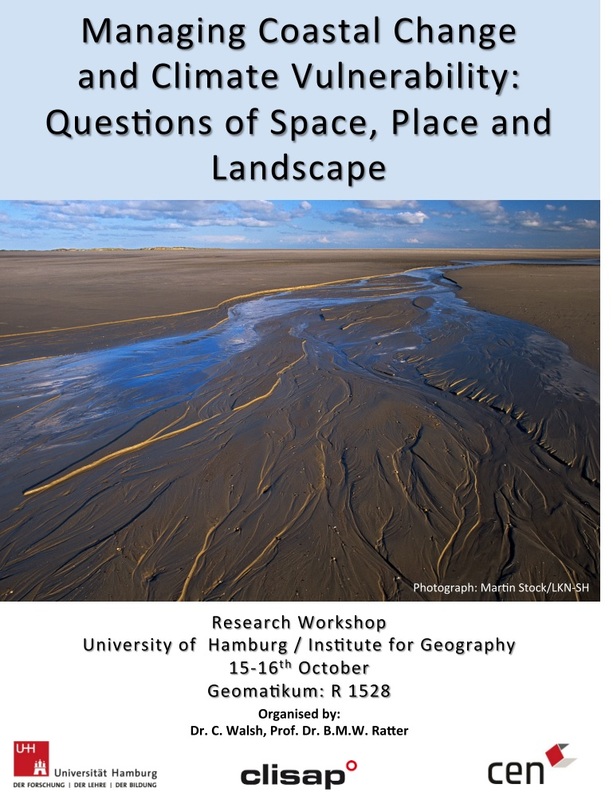 This workshop responds to this challenge, drawing together leading researchers internationally whose work provides important cultural and social-theoretic critiques both from within (spatial planning and coastal management disciplines) and without (cultural geography and environmental humanities). Adaptation to climate change and associated sea-level rise presents profound challenges for coastal regions across the world producing new vulnerabilities, risks and uncertainties. Climate change is increasingly recognised to require a fundamental reassessment of conventional approaches to coastal engineering which have typically relied on hard infrastructures of dykes, dams and sea walls (Temmerman et al 2013). From a cultural geography perspective, it may be argued that the abstract discourse of climate change is given meaning and becomes grounded through the engagement of coastal communities with dynamics of actual and anticipated change in the coastal land- and seascapes (cf. Ratter et al. 2009, Kremer et al 2013). Through this workshop we seek to develop a situated understanding of coastal management as a highly differentiated and place-specific set of practices. Treating coastal management as a set of situated practices implies an acknowledgement of the spatial contingency of scientific, professional and lay forms of knowledge (cf. Brace & Geoghagen 2011, 287). The workshop will bring a grounded comparative perspective to the question of managing coastal change which has been missing from academic and policy debates on integrated coastal zone management, climate change adaptation and the related field of marine spatial planning. The workshop will consequently focus on questions of spatiality which have received limited attention in the relevant literatures to date. Critical contributions to the growing literature on MSP from spatial planning scholars have argued for an in-depth reflexive engagement with MSP from a social science perspective. Kidd and Shaw (2014) critique the dominant instrumental if not technocratic view of MSP as a rational, technical process of universal applicability contending that marine spatial planning is ‘a social and political process that is inevitably highly differentiated and place-specific’ (2014, 2). We suggest that this critique is equally applicable to ICZM (and coastal management more broadly). Indeed, in spite of its longer history, the concept and practice of ICZM has generated remarkably little by way of critical social science research. At the same time, we argue for increased attention to the material dimension of coastal management and its impacts on the physical geography of coastal landscapes, whether through the construction of dykes, sea walls and other physical infrastructures or the allocation of land and sea -uses. Normative perspectives on ICZM and MSP, focussed primarily on questions of governance, have to date led to a partial neglect of the physical materiality of coastal management (McFadden 2007, 2008). It is evident that there are marked differences in the national and regional institutional contexts and frameworks within which coastal management is practiced across Europe. Coastal protection in Schleswig-Holstein in northern Germany may be considered as highly institutionalised occurring within a vertically-integrated governance structure where policy remits and competences are clearly delineated. In the neighbouring federal state of Lower Saxony, coastal protection draws on a long tradition of local community action organised through dyke associations. They continue to play an active role in the physical maintenance of the primary dyke line and cultural maintenance of a particular tradition of coastal protection. Practices of coastal protection have thus developed over many centuries and are embedded within the mentality and culture of local coastal communities (Fischer 2007, 2011). Indeed, experience at the German North Sea coast, indicates substantial resistance to change among coastal management practitioners, potentially constraining opportunities for developing and embracing innovative approaches (Rupp-Armstrong & Nicholls 2007). In this context, it is thus possible to speak of distinct cultures of practice, which have emerged within but are not reducible to distinct national institutional, legislative and cultural contexts. The concept of landscape can usefully serve to address the social and cultural values and framing implicated in the physical geography and materiality of coastal management from a social science perspective. Coastal management practices are instrumental in landscape change both in a physical and cultural sense. Adopting a situated perspective on coastal management implies that coastal management is materially and culturally situated in the landscape and reflects on its values. Drawing on constructivist approaches to landscape research we furthermore recognise that distinct sectoral institutional systems and discourse coalitions can lead to the simultaneous occurrence of multiple and conflicting constructions or framings of landscape and seascape in the same physical geographical area. Approached from this perspective the concept of landscape provides an important analytical link between aspects of materiality and the intangible aspects of spatiality. This entry was posted in Coastal Management, Conferences, environmental governance and tagged climate vulnerability, coastal management, cultural geography, landscape. Bookmark the permalink.